Housing Inventory Remains Low – For the 28th consecutive month, active inventory declined. At the end of October, inventory was 13.4 percent lower than the same point last year. This left 1,312 homes for sale at month’s end, with 2.3 months of supply heading into November. 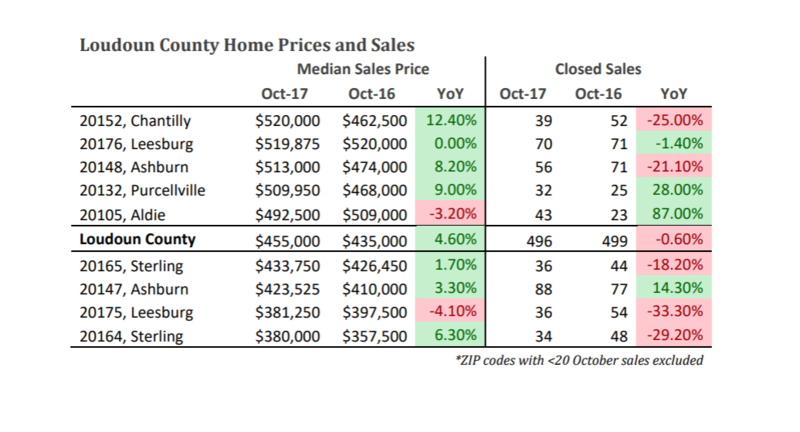 Homes are Selling Faster Than This Time Last Year – Loudoun County homes continue to sell faster than last year, with half of the October sales listing for 21 days or less, down from October 2016’s median of 29. Housing Prices Reaching Historic Highs – Loudoun County’s median home sale price reached $455,000 in October—an increase of 4.6 percent on an annualized basis. This is the highest October median sales value in over a decade. Sales growth continues to remain flat as the 496 closed sales in October represented a decrease of 0.6 percent over October 2016. This is a continued sign of low inventory suppressing sales, as prospective buyers find both limited choices and climbing home prices. However, slightly more home buyers signed contracts in October 2017 as compared to last October, as new pending sales increased 1.5 percent to 556. This a potential sign of increased sales in the coming months. Loudoun County’s median home sale price reached $455,000 in October—an increase of 4.6 percent on an annualized basis. This is the highest October median sales value in over a decade. For the 28th consecutive month, active inventory declined. At the end of October, inventory was 13.4 percent lower than the same point last year. This left 1,312 homes for sale at month’s end, with 2.3 months of supply heading into November. 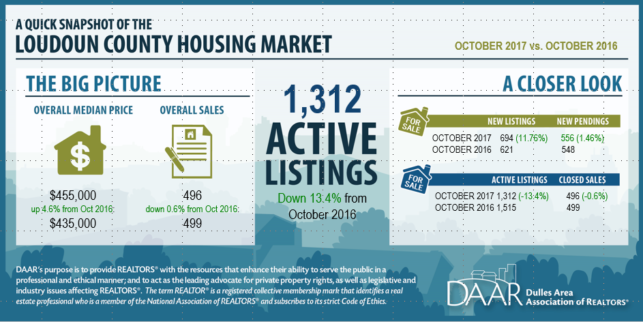 Reversing last month’s loss, new listing activity increased in October versus last year (+11.8 percent). Loudoun County added 694 new homes to the market in October and the number of year to date new listings is roughly even (-0.6 percent) with this time last year. The erratic change in new listings from month to month signals little long term relief from the market’s consistently low supply of homes. 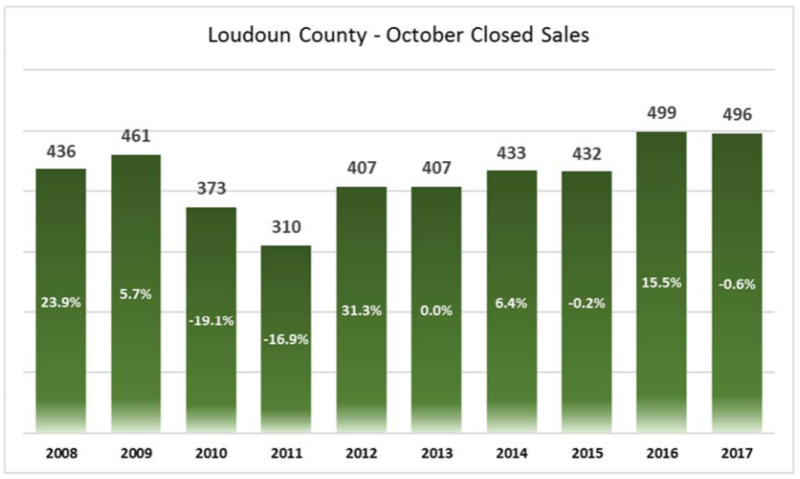 Loudoun County homes continue to sell faster than last year, with half of the October sales listing for 21 days or less, down from October 2016’s median of 29. Loudoun County home sellers received on average 97.3 percent of original list price in October. Demand remains for detached homes as the only segment to increase in number of closed sales and pending contracts—up 8.0 and 5.2 percent respectively from last October.